The Cricketers is a country pub and dining rooms with a large beer garden and outdoor patio dining in the summer. Sundays are made for spending time in a pub, and we do Sundays in a big way. Our menu includes 6 roasts and are available all day. We change our menu seasonally to take advantage of the best, locally sourced ingredients. 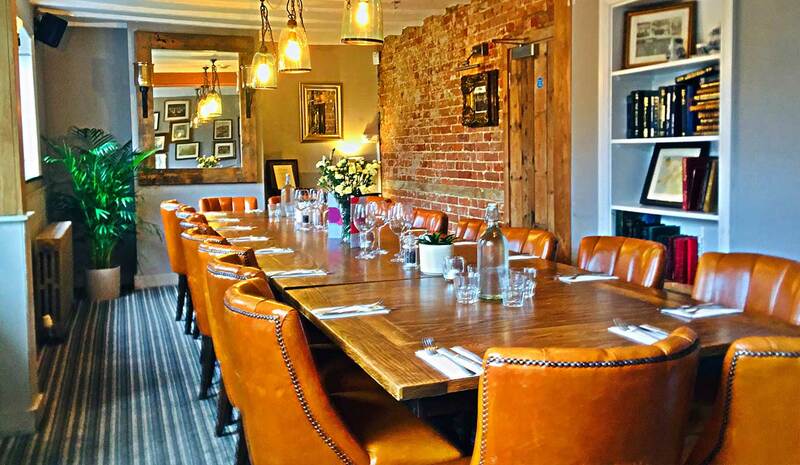 Our private dining room is absolutely perfect for any occasion. The Cricketers is a country pub and dining rooms with a large beer garden and outdoor patio dining in the summer. The pub is a beautifully refurbished and extended early 19th century public house. Once known to the locals as “The Old Orchard House”, we really are a hidden gem on Cricketers Lane in Warfield, just a short drive from Ascot Racecourse, Legoland and Bracknell. We are family friendly and also happy to welcome dogs into our bar and garden areas as we always have a jar of dog treats in the porch. Whether you want to warm yourself in the sun outside in the summer with a glass of Pimms or enjoy a perfect pint of cask conditioned real ale in front of a real log fire in the winter, the Cricketers is the perfect place for a drink. If you are looking for a great venue for a family get together, a working lunch, special occasion or a light snack we’d love you to join us. Book a table in our stunning dining room to make sure that you don’t miss out.